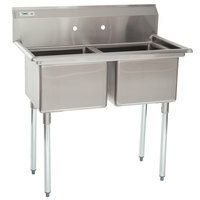 A 2 compartment sink is a great addition to any food service kitchen or washroom. The deep design of the basins make these sinks ideal for washing, rinsing, or sanitizing dinnerware, especially large stock pots. We offer double sinks in a number of configurations that come with or without drainboards depending on your available space or washing needs. For a sink that complies with additional sanitation guidelines, be sure to check out our NSF Listed models. Choose a 2 compartment sink with features like rolled edges and adjustable plastic feet, so you can customize the convenience of your unit. Whether you require a light- or heavy-duty sink, we have options in 304 and 430 type steel as well as 14, 16, or 18 gauge stainless steel to guarantee long-lasting durability. Made to fit in any size kitchen or dishroom, our sinks come in many sizes to accommodate any food service business. 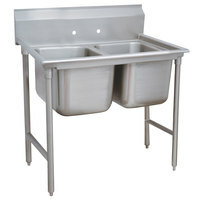 Advance Tabco FC-2-2424-24RL Two Compartment Stainless Steel Commercial Sink with Two Drainboards - 96"
Good - The Advance Tabco FC-2-2424-24RL 96" two compartment fabricated sink is great for dish washing applications! Made of 16 gauge stainless steel, it comes with 2 drainboards and features welded seams and cross bracing for long-lasting use in commercial settings. 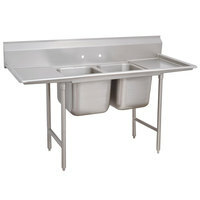 Best - Boasting durable 14 gauge stainless steel construction, this Advance Tabco FS-2-2424-24RL Spec Line 96" two compartment fabricated pot sink comes with 2 drainboards and is made to perform under high-volume commercial use. It features a continuous apron design that covers the outside of the bowl, ensuring optimal durability! Advance Tabco FC-2-1818 Two Compartment Stainless Steel Commercial Sink - 41"
Good - The Advance Tabco FC-2-1818 41" two compartment fabricated sink is great for dish washing applications! Made of 16 gauge stainless steel, it features welded seams and cross bracing for long-lasting use in commercial settings. Best - Boasting durable 14 gauge stainless steel construction, this Advance Tabco FS-2-1818 Spec Line 41" two compartment fabricated pot sink is made to perform under high-volume commercial use. It features a continuous apron design that covers the outside of the bowl, ensuring optimal durability! 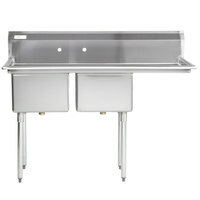 Good - The Advance Tabco FC-2-1824-18RL 72" two compartment fabricated sink is great for dish washing applications! Made of 16 gauge stainless steel, it comes with 2 drainboards and features welded seams and cross bracing for long-lasting use in commercial settings. 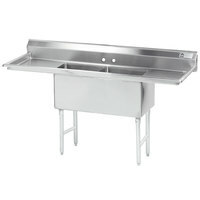 Best - Boasting durable 14 gauge stainless steel construction, this Advance Tabco FS-2-1824-18RL Spec Line 72" two compartment fabricated pot sink comes with 2 drainboards and is made to perform under high-volume commercial use. It features a continuous apron design that covers the outside of the bowl, ensuring optimal durability! 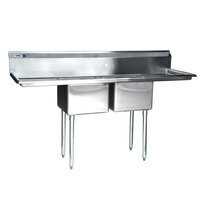 Good - The Advance Tabco FC-2-1818-18RL 72" two compartment fabricated sink is great for dish washing applications! Made of 16 gauge stainless steel, it comes with 2 drainboards and features welded seams and cross bracing for long-lasting use in commercial settings. 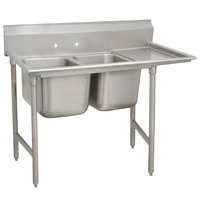 Advance Tabco FS-2-1818-18RL Spec Line Fabricated Two Compartment Pot Sink with Two Drainboards - 72"
Best - Boasting durable 14 gauge stainless steel construction, this Advance Tabco FS-2-1818-18RL Spec Line 72" two compartment fabricated pot sink comes with 2 drainboards and is made to perform under high-volume commercial use. It features a continuous apron design that covers the outside of the bowl, ensuring optimal durability! 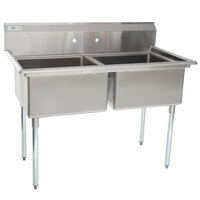 Advance Tabco FC-2-2424-18RL Two Compartment Stainless Steel Commercial Sink with Two Drainboards - 84"
Good - The Advance Tabco FC-2-2424-18RL 84" two compartment fabricated sink is great for dish washing applications! Made of 16 gauge stainless steel, the sink bowl comes with 2 drainboards and is built to resist corrosion and last a long time in commercial settings. Advance Tabco FS-2-2424-18RL Spec Line Fabricated Two Compartment Pot Sink with Two Drainboards - 84"
Best - Boating durable 14 gauge stainless steel sink bowls, this Advance Tabco FS-2-2424-18RL Spec Line 84" two compartment fabricated pot sink comes with 2 drainboards and is made to perform under high-volume commercial use. It features a continuous apron design that covers the outside of the bowl, ensuring optimal durability! Advance Tabco FC-2-2424 Two Compartment Stainless Steel Commercial Sink - 53"
Good - The Advance Tabco FC-2-2424 53" two compartment fabricated sink is great for dish washing applications! Made of 16 gauge stainless steel, it features welded seams and cross bracing for long-lasting use in commercial settings. Best - Boasting durable 14 gauge stainless steel construction, this Advance Tabco FS-2-2424 Spec Line 53" two compartment fabricated pot sink is made to perform under high-volume commercial use. It features a continuous apron design that covers the outside of the bowl, ensuring optimal durability! 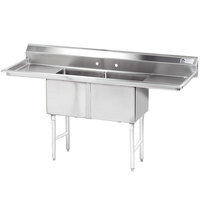 Advance Tabco 9-22-40 Super Saver Two Compartment Pot Sink - 52"
Good - The Advance Tabco 9-22-40 Super Saver 52" two compartment pot sink is made of 18 gauge 304 stainless steel for durability and a professional appearance. Complete with (2) 12" deep bowls and an 8" backsplash, this pot sink features welded stainless steel cross-bracing on the sides for stability. Advance Tabco 93-22-40 Regaline Two Compartment Stainless Steel Sink - 52"
Better - The Advance Tabco 93-22-40 Regaline 52" two compartment pot sink is made of 16 gauge 304 stainless steel for increased durability and a professional appearance. Complete with (2) 12" deep bowls and an 8" backsplash, this pot sink features welded stainless steel cross-bracing on the sides for stability. Best - The Advance Tabco 94-22-40 Spec-Line 52" two compartment pot sink is made of 14 gauge 304 stainless steel for enhanced durability and a heavy-duty professional appearance. Complete with (2) 14" deep bowls and an 11" backsplash, this pot sink features welded stainless steel cross-bracing on the front, rear, and sides for increased stability. Advance Tabco 9-22-40-18RL Super Saver Two Compartment Pot Sink with Two Drainboards - 81"
Good - The Advance Tabco 9-22-40-18RL Super Saver 81" two compartment pot sink is made of 18 gauge 304 stainless steel for durability and a professional appearance. Complete with (2) 12" deep bowls, an 8" backsplash, and (2) 18" drainboards, this pot sink features welded stainless steel cross-bracing on the sides for stability. Advance Tabco 93-22-40-18RL Regaline Two Compartment Stainless Steel Sink with Two Drainboards - 81"
Better - The Advance Tabco 93-22-40-18RL Regaline 81" two compartment pot sink is made of 16 gauge 304 stainless steel for increased durability and a professional appearance. Complete with (2) 12" deep bowls, an 8" backsplash, and (2) 18" drainboards, this pot sink features welded stainless steel cross-bracing on the sides for stability. 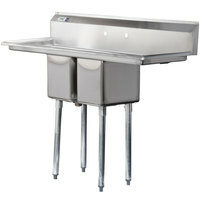 Advance Tabco 94-22-40-18RL Spec Line Two Compartment Pot Sink with Two Drainboards - 81"
Best - The Advance Tabco 94-22-40-18RL Spec-Line 81" two compartment pot sink is made of 14 gauge 304 stainless steel for enhanced durability and a heavy-duty professional appearance. Complete with (2) 14" deep bowls, an 11" backsplash, and (2) 18" drainboards, this pot sink features welded stainless steel cross-bracing on the front, rear, and sides for increased stability. 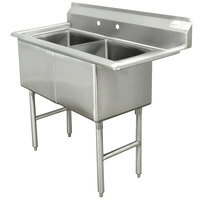 Good - The Advance Tabco 9-22-40-24RL Super Saver 93" two compartment pot sink is made of 18 gauge 304 stainless steel for durability and a professional appearance. Complete with (2) 12" deep bowls, an 8" backsplash, and (2) 24" drainboards, this pot sink features welded stainless steel cross-bracing on the sides for stability. Advance Tabco 93-22-40-24RL Regaline Two Compartment Stainless Steel Sink with Two Drainboards - 93"
Better - The Advance Tabco 93-22-40-24RL Regaline 93" two compartment pot sink is made of 16 gauge 304 stainless steel for increased durability and a professional appearance. Complete with (2) 12" deep bowls, an 8" backsplash, and (2) 24" drainboards, this pot sink features welded stainless steel cross-bracing on the sides for stability. 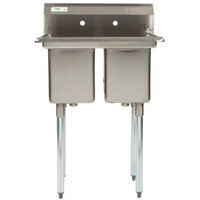 Advance Tabco 94-22-40-24RL Spec Line Two Compartment Pot Sink with Two Drainboards - 93"
Best - The Advance Tabco 94-22-40-24RL Spec-Line 93" two compartment pot sink is made of 14 gauge 304 stainless steel for enhanced durability and a heavy-duty professional appearance. Complete with (2) 14" deep bowls, an 11" backsplash, and (2) 24" drainboards, this pot sink features welded stainless steel cross-bracing on the front, rear, and sides for increased stability. Advance Tabco 9-22-40-36RL Super Saver Two Compartment Pot Sink with Two Drainboards - 117"
Good - The Advance Tabco 9-22-40-36RL Super Saver 117" two compartment pot sink is made of 18 gauge 304 stainless steel for durability and a professional appearance. Complete with (2) 12" deep bowls, an 8" backsplash, and (2) 36" drainboards, this pot sink features welded stainless steel cross-bracing on the sides for stability. Better - The Advance Tabco 93-22-40-36RL Regaline 117" two compartment pot sink is made of 16 gauge 304 stainless steel for increased durability and a professional appearance. Complete with (2) 12" deep bowls, an 8" backsplash, and (2) 36" drainboards, this pot sink features welded stainless steel cross-bracing on the sides for stability. 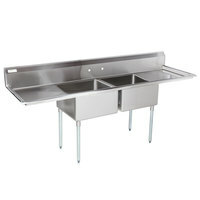 Advance Tabco 94-22-40-36RL Spec Line Two Compartment Pot Sink with Two Drainboards - 117"
Best - The Advance Tabco 94-22-40-36RL Spec-Line 117" two compartment pot sink is made of 14 gauge 304 stainless steel for enhanced durability and a heavy-duty professional appearance. Complete with (2) 14" deep bowls, an 11" backsplash, and (2) 36" drainboards, this pot sink features welded stainless steel cross-bracing on the front, rear, and sides for increased stability. 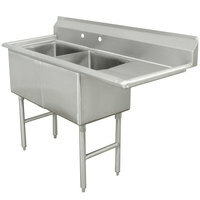 Advance Tabco 9-2-36 Super Saver Two Compartment Pot Sink - 44"
Good - The Advance Tabco 9-2-36 Super Saver 44" two compartment pot sink is made of 18 gauge 304 stainless steel for durability and a professional appearance. Complete with (2) 12" deep bowls and an 8" backsplash, this pot sink features welded stainless steel cross-bracing on the sides for stability. Better - The Advance Tabco 93-2-36 Regaline 44" two compartment pot sink is made of 16 gauge 304 stainless steel for increased durability and a professional appearance. Complete with (2) 12" deep bowls and an 8" backsplash, this pot sink features welded stainless steel cross-bracing on the sides for stability. Best - The Advance Tabco 94-2-36 Spec-Line 44" two compartment pot sink is made of 14 gauge 304 stainless steel for enhanced durability and a heavy-duty professional appearance. Complete with (2) 14" deep bowls and an 11" backsplash, this pot sink features welded stainless steel cross-bracing on the front, rear, and sides for increased stability. Good - The Advance Tabco 9-2-36-18RL Super Saver 72" two compartment pot sink is made of 18 gauge 304 stainless steel for durability and a professional appearance. Complete with (2) 12" deep bowls, an 8" backsplash, and (2) 18" drainboards, this pot sink features welded stainless steel cross-bracing on the sides for stability. Advance Tabco 93-2-36-18RL Regaline Two Compartment Stainless Steel Sink with Two Drainboards - 72"
Better - The Advance Tabco 93-2-36-18RL Regaline 72" two compartment pot sink is made of 16 gauge 304 stainless steel for increased durability and a professional appearance. Complete with (2) 12" deep bowls, an 8" backsplash, and (2) 18" drainboards, this pot sink features welded stainless steel cross-bracing on the sides for stability. Best - The Advance Tabco 94-2-36-18RL Spec-Line 72" two compartment pot sink is made of 14 gauge 304 stainless steel for enhanced durability and a heavy-duty professional appearance. Complete with (2) 14" deep bowls, an 11" backsplash, and (2) 18" drainboards, this pot sink features welded stainless steel cross-bracing on the front, rear, and sides for increased stability. 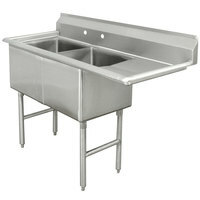 Advance Tabco 9-2-36-24RL Super Saver Two Compartment Pot Sink with Two Drainboards - 85"
Good - The Advance Tabco 9-2-36-24RL Super Saver 85" two compartment pot sink is made of 18 gauge 304 stainless steel for durability and a professional appearance. Complete with (2) 12" deep bowls, an 8" backsplash, and (2) 24" drainboards, this pot sink features welded stainless steel cross-bracing on the sides for stability. Advance Tabco 93-2-36-24RL Regaline Two Compartment Stainless Steel Sink with Two Drainboards - 85"
Better - The Advance Tabco 93-2-36-24RL Regaline 85" two compartment pot sink is made of 16 gauge 304 stainless steel for increased durability and a professional appearance. Complete with (2) 12" deep bowls, an 8" backsplash, and (2) 24" drainboards, this pot sink features welded stainless steel cross-bracing on the sides for stability. Advance Tabco 94-2-36-24RL Spec Line Two Compartment Pot Sink with Two Drainboards - 85"
Best - The Advance Tabco 94-2-36-24RL Spec-Line 85" two compartment pot sink is made of 14 gauge 304 stainless steel for enhanced durability and a heavy-duty professional appearance. Complete with (2) 14" deep bowls, an 11" backsplash, and (2) 24" drainboards, this pot sink features welded stainless steel cross-bracing on the front, rear, and sides for increased stability.